Who Makes the Present, Who Inhabits the Room? 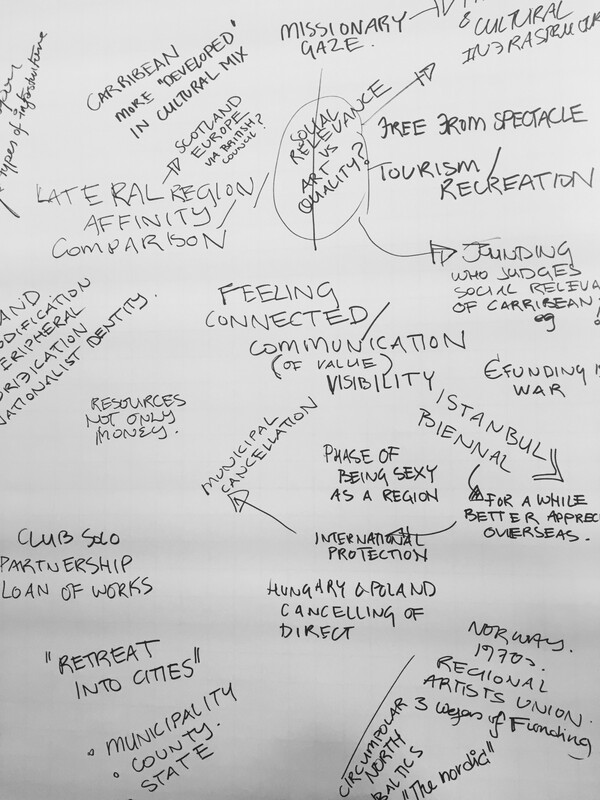 Who makes the present, who inhabits the room, who and what is a curator and what do curators do? 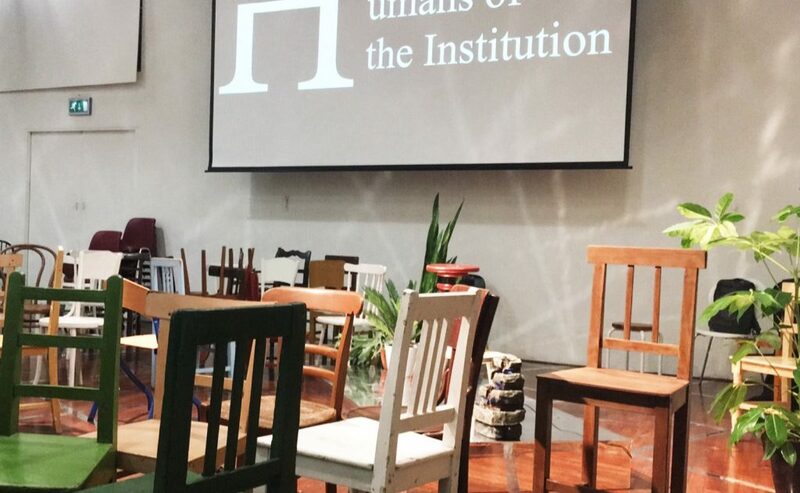 Humans of the Institution was a curator organized three-day gathering in Amsterdam about questions of “who makes the present”, globalising dynamics, working conditions, institutional structures and freelancer working conditions, obstacles and mechanisms. “Just when you think the show is terrible, something wonderful happens” was a starting quote from the Muppets, guiding us into the intensive three days, eventually much more wonderful than terrible. As the organizers stated: “Across its two days, the conference programme foregrounds freelance experiences in the arts, taking into account transforming institutional structures, distributions of non/employment at global scales, and emerging regimes of networked governance.” “Questioning our working conditions also demands of us to question the formats we produce. Humans of the Institution intends to experiment with the way curators create public conversations and discussions, how we take care of and engage with those in room — and those without — regardless of how they come to the space.” During the symposium, we most certainly were taken care of: three days of inspiring talks and discussions, enough coffee breaks, food and wine, and finally the working groups involving everyone interested in the process of producing statements about current questions and situations in global and local context. Saturday started with the theme Whose Global, Whose Local? and Rachel O’Reilly’s paper about boycotts in the context of exhibitions and biennales — saying publicly no to exploitation and appropriating subjects. Following this Despina Zefkili was talking about Athens, energy and sustainability: different kinds of crises produce new ways of action and new kinds of knowledges and ideas for sharing them, but how to sustain these practices? As was said, “history is written through claiming”, and in peculiar situations the possibilities of illuminating dominant structures is maybe both easier and more relevant, but how to continue the conversations once opened, and how to introduce different horizontality to this conversation? Are we creating new languages and new practices, and are we able to do this without generalizing? Are the new collective practices enough, or should we ask for more for the art world to become “more professional”, instead of just generating destructive and reckless “cowboy economies” not knowing what they are and what they are going to be? Did this same situation happen already during the Balkan crisis, and did it develop into any sustainable solutions? Quite a few themes, nothing truly new though, came constantly up in presentations and talks. One of them was social solidarity, and of course general need of that, but the special need of solidarity among the precarious workers in the field of art. Even if the demand is understandable, it seems like a quite lot to ask — I don’t think it is about not wanting to be solidary and not wanting to share, was it then the money or knowledge, but more about not having anything to share, or not having the resources of sharing the little one has got. The notion of “non-payment culture” is too correct. Nonetheless, solidarity is a topic not to be despised. Solidarity embedded into system increases solidarity in personal level, and vice versa. I think this is something we especially in Finland need to elaborate. The theme of Saturday’s talks was whose global and whose local, but instead there was a lot talk about Sundays topic Precarious practices. Turned out that on Sunday we nevertheless came back to talking about the precarious practices, so there was no harm done. And as already the introduction shows, these elements can’t really be separated, but they are entangled: “Over the reunification era of the 1990s, the freelance curator appeared as an ideal figure of new world optimism — a magic-worker who, by selecting art from across the planet, could stitch together the dream of the global village. From the view-point of the present time however, the ‘freedom’ of the world is revealed not only in the fantasy of unfettered movement, but in the sell-off public assets, in the ‘liberalisation’ of labour markets and mineral sources, and in widening wealth inequalities that bear links to colonial eras. What forms of social or cultural consciousness, and organising, can straddle these contradictions long enough to effect change in ‘industry standards’ in contemporary art, and further afield? On the other hand, curator seems to be someone, who can create spaces with a sense of belonging: in a way, they can be thought as Thirdspaces, where people come together, feel safe, connect, are able to be present. This, in turn, needs resources. Curating can also be, and hopefully is, rebellious practices where “human capital” is replaced with “human infrastructures” (Thank you, Arkadiusz Półtorak for this suggestion!). The future was discussed, but no one seems to know what to think of it. There is a need for shaking structures and strategies, but how to do this? We need to be hospital, good hosts (I think this concerns us as curators, but even more us as human beings in the contemporary state of the world). And when we do share things, how to share them without universalizing? This point was also emphasized on Sunday, when Antonia Majaca started the day with Against Curating as Endorsing presentation. Majaca talked about curator as a mediator in a “risky business” of institutions and practices mapping totalities and normalizing infrastructures, suggesting that we should fight against the dominance of a confident white male curator and fixed ontologies with fuzzy logic, diversity and transversive eye. As curators, we should be able to accept our vulnerability and the uncertainty of everything, and also be ready for the risk of failing miserably. This I totally agree with, but in contemporary neoliberal system that drives with success, how to develop sustainable practices based on possible failing? 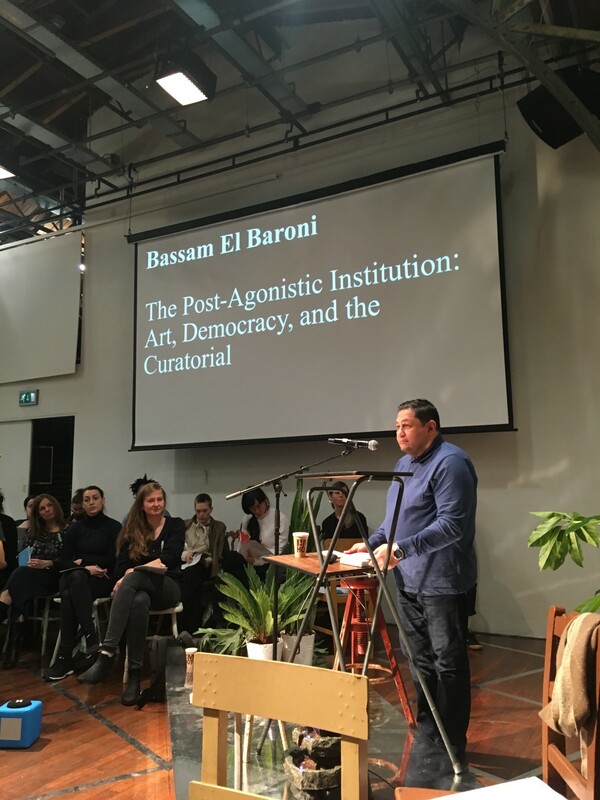 After Majaca, Bassam el Baroni continued with highly inspirational The Post-Agonistic Institution. Art, Democracy, and the Curatorial presentation, asking if we can think of other designs than democratic design and if liberal democracy is a heritage to care for. Related to this, he also asked if we should replace the idea of public space as a antagonistic battle ground with the idea of reasoning together. What happens if we try not to mimic democracy, but think past it? On the other hand, we can ask if art world can even be seen as “democratic”, as Matthijs de Bruijne did in the afternoon session, stating that “radical thinking without radical activity does not mean anything.” Afternoon session was in general lot about ethics and power relations, and about languages we use to sustain or renew them: we need to think about the language we use, and how we use them, be aware of the hierarchies and our position in the dialogues we are part of. 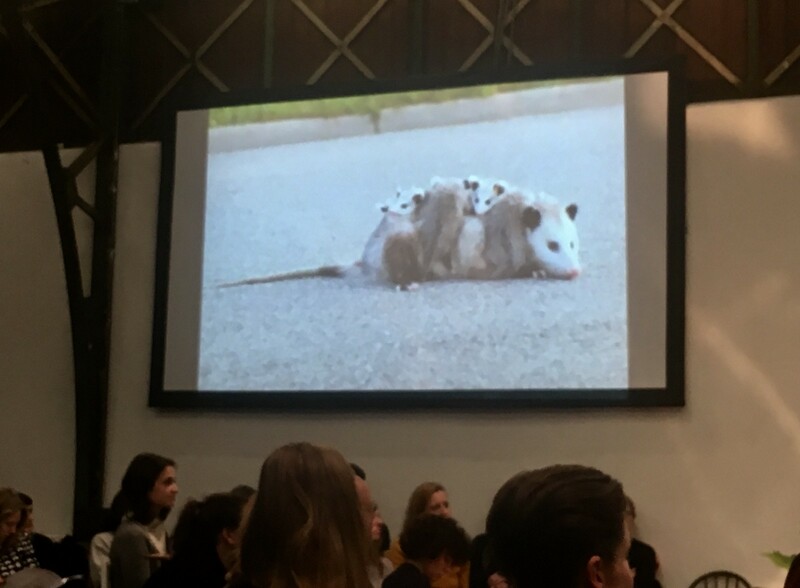 This discussion did partly continue in our Critical Regionalism working group on Monday at the Stedelijke Museum, where we went deeper into topics of regional versus metropolitan practices, regional funding, grand narratives versus local narratives and about responsibility. This discussion will be collected into a comment paper later on. Even after all the deep and intense debate I feel like some of the elementary topics were untouched. We did talk about the terms “freelancer” and “independent curator” — which one to use, and if the latter has got more positive connotations (I think it does), but the question what we mean by “institution” was hardly touched. In this context, mostly museums, but there are also other kinds of institutions in the art scene, providing both opportunities and obstacles. In our working group, we did also talk about becoming an institution though, and among other super interesting talks we had, I think this was important. Institutions, as already mentioned in the end of the Sunday session, can and should be matrixes of the future possibilities, sets of resources, and something that can be activated when needed. The question of becoming an institution is, I think, closely related to the issues of funding and values, and so on to the questions of formations art can take in the future. And this is related to the question of art: why do we not talk about art? Or is it that the independent curator is taking the space of the artist, filling spaces not with objects but ideas? Is curating a new form of conceptual art? The whole symposium was a good example of succeeding in trying to find new ways to gather and contemplate. The space in Veem House for performance was well designed, thanks to Uglyccute’s spatial design, and it did break the formal structure of a seminar space well. Or maybe it was the soft, colourful, throwable microphones that made people feel safe and willing to open up? Or the already mentioned food and wine — nothing really brings people together like eating, but in addition to just continuing the tradition of eating and offering food in a context of art, here the food was well needed fuel to be able to concentrate on the well curated but quite intensive programme. What also made these intense days tolerable and the discussion free-flowing was the super job Anne Szefer Karlsen and Vivian Ziherl did with moderating. And everything else too, so thank you both! For the future contemplation: “what are we actually doing”? This is my practice, but what does it really mean? These questions were asked in the symposium, but not fully answered. And: are we at the service of something or someone, and if so, are we always aware of it? I find it often surprisingly hard to answer these myself. And then there was the theme of hospitality and hostility most certainly needing closer pondering. 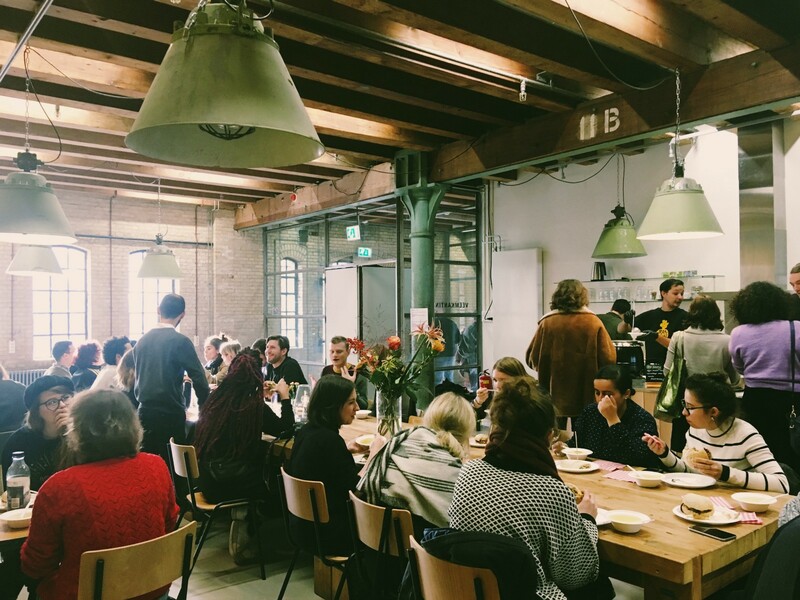 Hospitality is something I’ve been already thinking a lot lately, hostility is something that comes quite naturally to me, but how to use these two concepts in a productive way in the context of art, curating and research? ViCCA Alumna, MA and Doctoral Candidate Anna Jensen (1978) is a curator, researcher, artist and art critic currently working as a researcher and doctoral candidate in Aalto University and working on her doctoral thesis on the concept of unheimlich (uncanny) in contemporary art and urban space. Jensen is part and founding member of the Porin kulttuurisäätö collective whose work aims to combine art and research and to explore and reconstruct existing structures of the art world and our society. Together with Eliisa Suvanto they have also created the Space Invaders concept that takes over empty and abandoned spaces, creates multidisciplinary projects of short duration thereby taking part in the conversation about public space and existing power relations.